Lunarlon Sockliner: Designed and used by Nike (who owns Converse) the Lunarlon Sockliner provides great cushioning and support. It’s foamy quality is a nice change of pace for us walkers who buzz around town on foot and could use a little extra bounce in our step. Padded Non-Slip Tongue: It’ll keep your tongue in place so you don’t have to keep untying your laces, pulling up and over the tongue, and then retying your laces. It wasn’t a real big deal for us, but our OCD is thankful. Microsuede Lining: This will allow your feet to breathe a bit more and will certainly cut down on the smelly-sneaker-factor. We’d still pair them with our favorite no-show socks. See? That’s not so bad, right? Change can be good. We’re digging these new Chucks even if the price can range between $10-15 more than our old pairs, but it’ll totally be worth it. These bad boys will run you anywhere from $70-75+ depending. 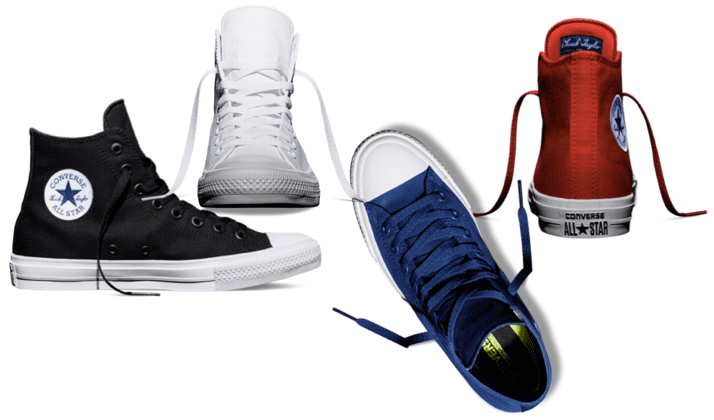 Converse debuted these officially on July 28th and you can order them here.